It is a mountain that is relatively easy to climb with minimal objective danger. It is a great opportunity to experience the surreal world of extreme altitude, to train for an Everest climb or to achieve your first 8,000m peak. This is a classic route with a very high success rate. Although the challenge is perhaps less than that of the Everest climb it is the best training for it. 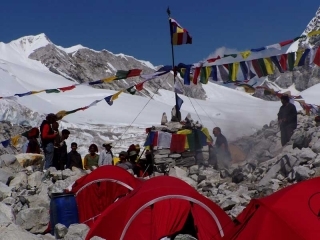 Cho Oyu will give time to figure out all the details, test gear, work with a sherpas team. we will ensure the same care and attention in the preparation of BC (4,200m) and ABC, the same detailed safety precautions on the mountain and, of course, the same degree of service from your guides and Sherpas. Above ABC (5,800m) we use three camps. Camp 1 (6,600m) is at the top of a long easy scree slope. From here the route is entirely on snow. We follow a gentle rounded ridge until we hit a short but steep ice cliff. We use a fixed rope to negotiate the cliff (normally about 20m) and then continue across a gentle glacier before we start another slightly steeper slope, again equipped with a fixed rope. Camp 2 (7,100m) is on an easy snow slope. The day to reach Camp 3 (7,400m) is relatively short, about 3 – 4 hours, climbing more gentle snow slopes. 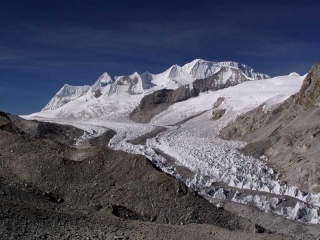 From here we can reach the summit in 5 – 7 hours and return to Camp 2 for the evening. This final day consists of climbing intermediate snow slopes until we reach a series of rock bands which we cross by way of their snow ledges. We come out onto a snow slope leading us to the summit ridge and then what is often mistaken to be the almost flat summit itself. The real summit is still about 400m away on almost flat snow.The retreat is then fairly fast but with time to enjoy the spectacular surrounding scenery.